Pets are a lot like people, when you think in terms of social, emotional and health-care needs. 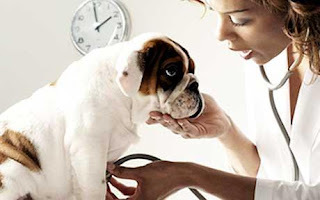 Pets enjoy company; they express worry and happiness; and they require routine doctor's visits. Females should be spayed (removal of the ovaries and uterus) and males neutered (removal of the testicles) by the time their 6 months old. Spaying before maturity significantly reduces the risk of breast cancer, a common and frequently fatal disease of older female dogs. It eliminates the risk of an infected uterus, a serious problem in older females that requires surgery and intensive medical care. Neutering males prevents testicular and prostate diseases, some hernias and certain types of aggression. Plus, spaying and neutering eliminates unwanted litters which contribute to the huge problem of abandoned and homeless pets in our country. Just like people, pets are vaccinated to protect them from highly contagious and deadly diseases. With decades of widespread vaccinations, many of these diseases are no longer common, but the shots are still recommended. One reason is because the disease agents are still in the environment. Pets can also be vaccinated for some zoonotic (pronounced ZOE-oh-not-ick) diseases, which are those that can be spread from animals to people. For example, rabies is a serious, often fatal, disease that can spread from infected animals to people. By vaccinating your pets for rabies, you're protecting your family, too. Dogs are commonly exposed to parasitic worms and possible infestation, even in urban areas. The most common are roundworms, hookworms, whipworms and tapeworms. Microscopic eggs produced by intestinal worms are passed in an infected dog's feces. Most puppies, even from healthy mothers in good homes, carry roundworms or hookworms. Healthy pets may not show signs of a worm infection. However, if you notice a change in your pet's appetite or coat, diarrhea, or excessive coughing, see your veterinarian. In most cases, a simple test can detect the presence of intestinal worms, and treatment is simple and effective. Using a monthly heartworm preventative that also protects against other worms is a good way to avoid a problem. Prompt treatment of internal parasites means less discomfort for your pet and less chance of intestinal damage. It also decreases the chance your pet will infect humans or other animals. And don't forget about those nasty heartworms. These can kill an animal, and treatment is neither simple nor always effective. This parasite lives in the heart and is passed from dog to dog by mosquitoes. Your dog should have a blood test for heartworm every spring – this is crucial for detecting infections from the previous year. A once-a-month preventative pill should protect your dog. Bad breath is an indication that your dog needs of a dental check up. Dental plaque caused by bacteria results in a foul smell that requires professional treatment. After a professional cleaning, keep teeth and gums healthy with regular brushing and a diet formulated for good dental diet. One of the simplest preventative measures is to pet your pet every day. It not only provides for their social and emotional needs, but also helps you become very familiar with what's normal and healthy, so that you'll recognize it when a problem arises.